Compact, pre-installed header assembly for low headroom applications now standard. 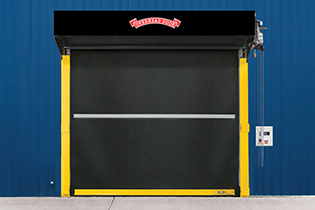 The RapidFlex® high speed rubber rolling doors are designed for extreme, heavy-duty applications. The rugged petrochemical resistant NBR rubber curtain is reinforced with polyester weave for added strength without the weight. This door features a patent-pending curtain lock design and was independently tested for pressure resistance and can withstand up to 180 mph and is operatable up to 75 mph. The heavy-duty guide construction for this door is designed for harsh conditions.